**Warning - the photos and content on this blog are protected by international copyright laws, and may not be republished, rewritten, or reproduced in any manner without written permission from the author. 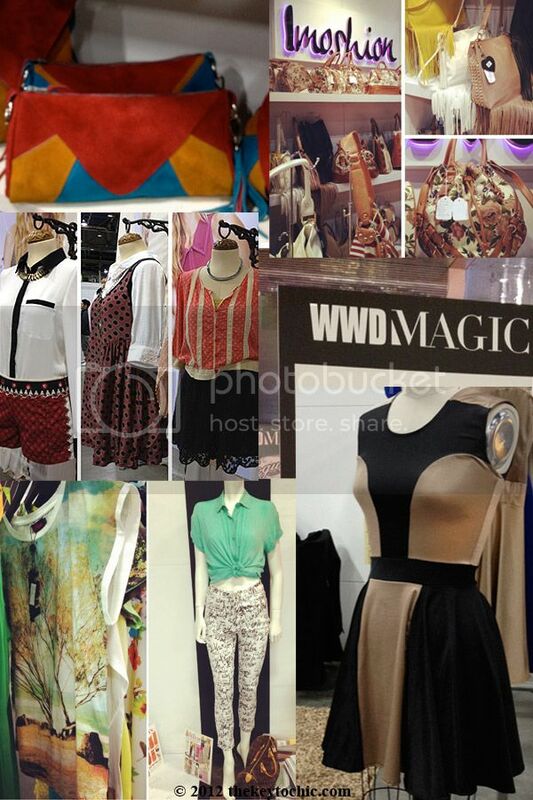 I finally experienced a slice of fashion heaven also known as WWDMAGIC. Although I went prepared, it was every bit as overwhelming and stimulating to the senses as I imagined. Picture thousands of vendors, even more attendees, endless street style inspiration, high energy music, row upon row of booths filled with fashionable objects and buyers, and a bewilderingly large floor plan with multiple trade shows showcasing everything from activewear and indie jewelry to edgy footwear and feminine frocks. My tips for being productive were: having a schedule, studying the floor plan ahead of time, staying hydrated, bringing multiple cameras, having plenty of business cards and a notebook, wearing comfortable shoes, and remembering to take it all in and have fun. My objectives were to visit vendors, discover new brands, attend blogger panels, take copious notes during the seminars, meet new people, identify key trends for upcoming seasons, and photograph as much as I could. Although it's easy to succumb to all of the things that Vegas has to offer (endless buffets, gambling, shows, shopping, nightlife, etc. ), I remained focused on gathering as much information as possible. OK, so I had a moment of weakness, and did some shopping; the florals at Zara were practically calling my name. Expect to see store window photos very soon on my other fashion blog. Now onto the good stuff. Key trends for women include: color blocking, digital and photographic prints, whimsical bird prints, lace and crochet, lots of sheer and mesh fabrications, cutouts, watercolor and saturated florals, neons, and perforated/cutout details on women's footwear. Sporty looks, 1950s silhouettes, Native American print inspiration, and 1920s influences will also be significant going into 2013. Additional women's footwear trends are: iridescent treatments and metallic finishes, cowboy ankle boots in bright colors and prints, fringe, sculptural ankle boots, and color blocked platforms in bright hues. If I had to choose two trends that predominated, they'd be neons and color blocking - both in apparel and footwear. I'll be posting spring/summer 2013 trend and color reports soon, but for now, here's an overview of some of the memorable things I spotted. 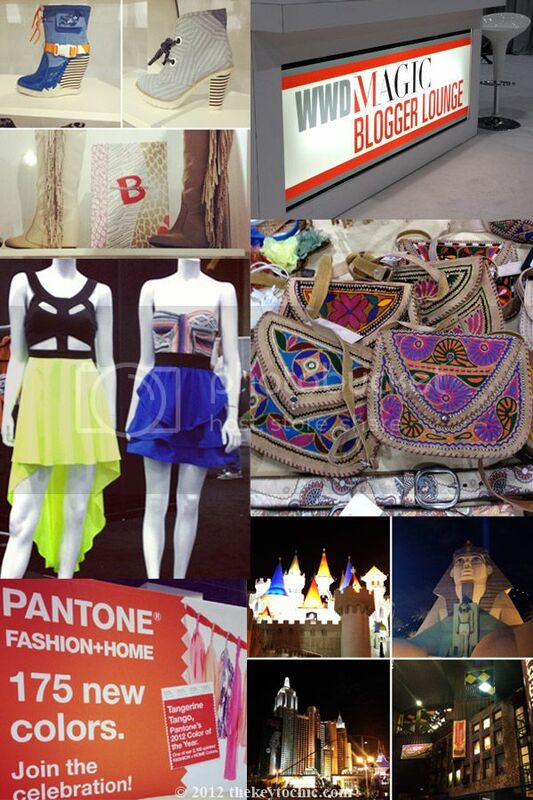 Pictured above, clockwise from top left: B by Aperire footwear, the WWDMAGIC blogger lounge, Z&L by Zudor handbags from Spain, a few of the sights & hotels I saw in Vegas, Pantone's color of the year - tangerine tango, and some standout dresses I spotted at Project. Pictured above, clockwise from top left: color block handbags by Chicago accessories line Souldier, Imoshion floral and fringe handbags, a Johanna Christine dress, graphic printed pieces by Motel, and three casual fall looks by Free People.